My dear husband brought home a bouquet of tulips along with the groceries last evening. I re-cut the stems and arranged them in a vase for the table. This is my view from my easy chair in the family room. Seeing those flowers on the table makes me happy. 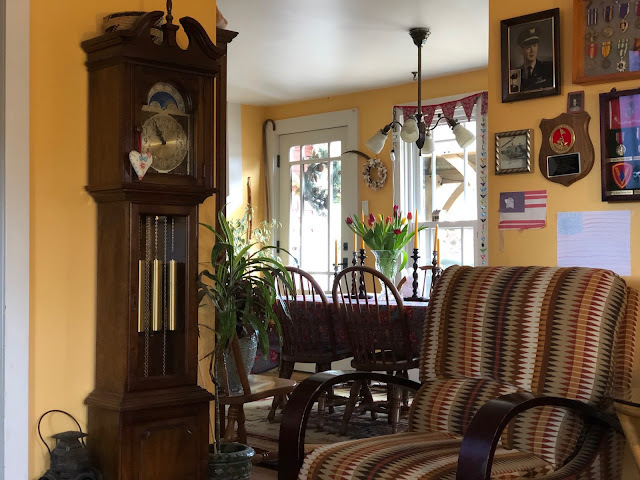 After the glitter and color of the holidays, I'm enjoying the serenity of a tidy home. 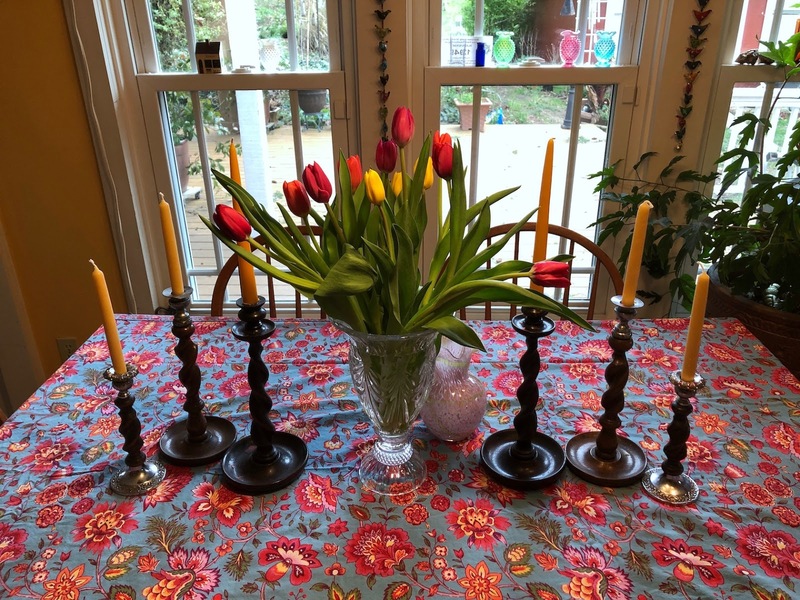 I have seen bouquets of daffodils on some of my English blog friend's tables which inspired me to get some, but we don't have any available here, at least Costco doesn't have any. But they did have tulips! The flowers have gotten bigger since I put them in the vase, I am enjoying watching for them to open and change. And with these Spring-y colors on my lap as I crochet, it's bringing me hope that Winter will pass quickly and the temperatures will warm and the flowers in our wild farm garden will bloom once again. I'm off to drive through the icy winds to plunge myself into a pool of cool water. Egads. But with that said, swimming is my favorite form of exercise and I need to keep my heart strong.. and so.. ya gotta do what ya gotta do. Right? Your surroundings are beautiful and you should be commended for making them so. Oh cold pool..........kudos to you! Im under an electric blanket currently being kind of hogged by Fezzik. Im freezing in my house. Tulips!!! Be still my heart. Could that possibly mean that spring is on the way? We woke up to such a foggy day today that I couldn’t see across the street, but that’s still better than snow! Your blanket is so pretty. I’m loving watching it take shape. I hope you had a good swim Teresa. 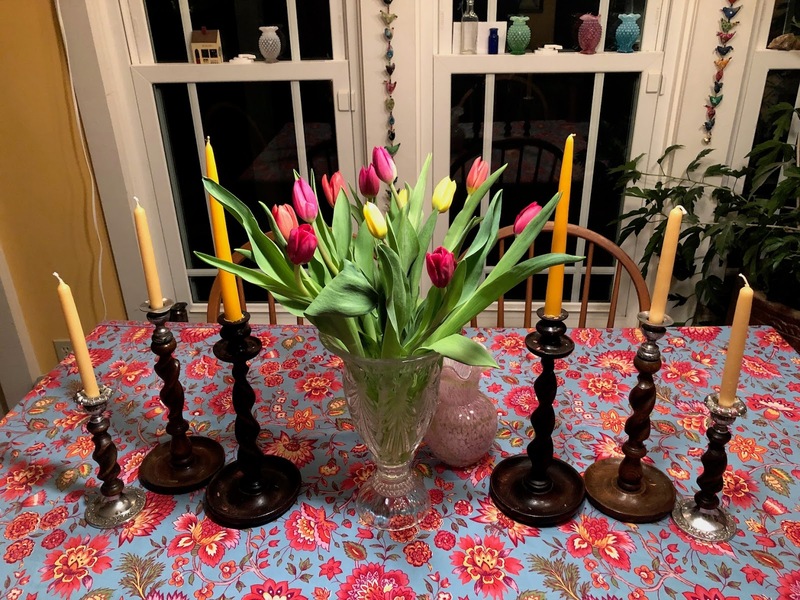 Tulips are my fave flowers and yours look wonderful in your cozy home. Teresa, what a great blog you have. Love the photos of your beautiful home. 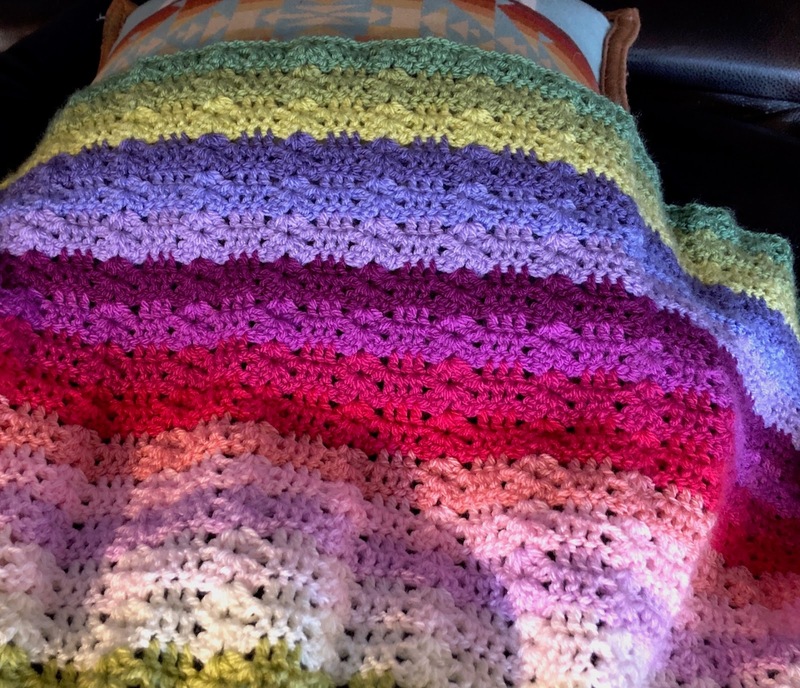 I read back a ways, and saw your progress on the blanket from Lucy's blog. I've been following her for quite a while, but as a novice crocheter, I haven't tried the blanket. Sorry to read about Buddy, he was adorable, and it seems you gave him a wonderful life. I'll be back to read more for sure. Thank you for sharing your life! What beautiful tulips! Too early for them here. I do love fresh flowers, they make a room so cheerful. The tulips look beautiful on your table. I have a bunch on mine at the moment, no sign of daffodils as yet here either. Well done on the swim, I am about to do my shoulder therapy exercises. The tulips look gorgeous, enjoy and I'm loving your sweet pea blanket. Lovely tulips and a sweet husband...that should make up for the cool pool water - lol. Hope your weekend is going well! The tulips are so pretty. And your home is always so cozy and inviting. Great progress on your blanket. Beautiful flowers Teresa, tulips are one of my favorites. I love the colors, they remind me of your beautiful blanket. Hugs to you. Tulips... My love! 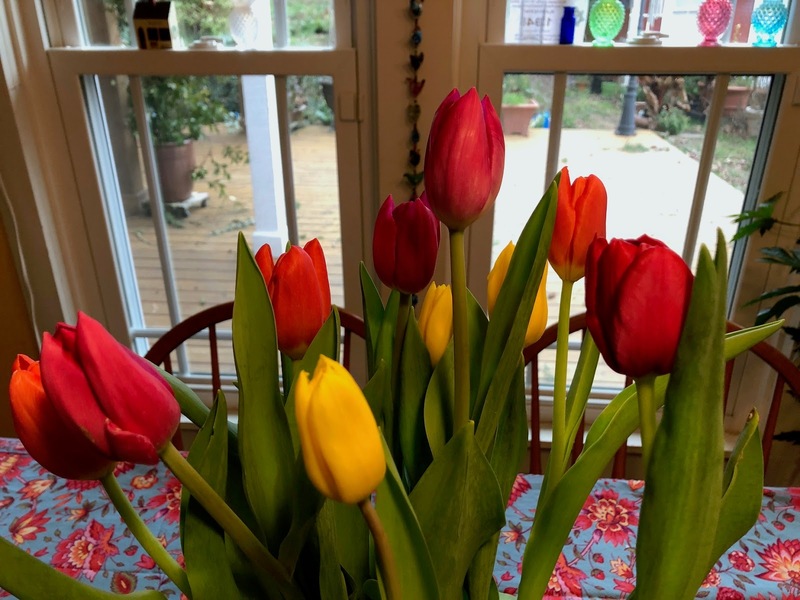 I have enjoyed the beauty of tulips since I was very young, oh they just ooze of glory. You have a lovely place here, so happy I have found you.